There is much to be gained from practising pranayama which is part of Yoga and a fairly huge part. I’ve been doing Yoga for nearly twelve years—both practising and teaching. I’ve seen some huge changes in me. The most profound have come from meditation and pranayama. Physical Yoga has been useful too but I think we miss a huge amount when we concentrate just on that. Ancient Yoga has always been about meditation and pranayama. The main thing is not to think about filling your lungs with air but just to follow your breath with your mind and listen to the sound of the breath. 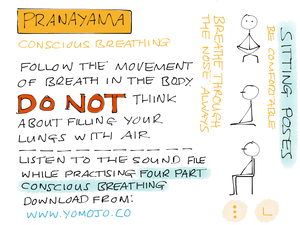 The great thing about ujjayi pranayama is that you can practice it anywhere—while driving the car, at work, watching tv, cooking, walking, at bedtime… so whenever you need to relax just do some ujjayi pranayama for a few minutes. Pranayama stimulates the vagus nerve which activates the parasympathetic nervous system and so relaxing the whole body. Please note: if you have any kind of medical condition please consult your doctor first.